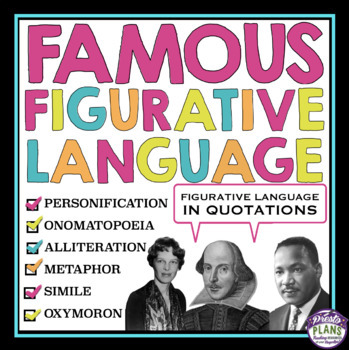 FIGURATIVE LANGUAGE ACTIVITY: QUOTES TASK CARDS: Help your students practice finding figurative language with this fun and engaging activity. 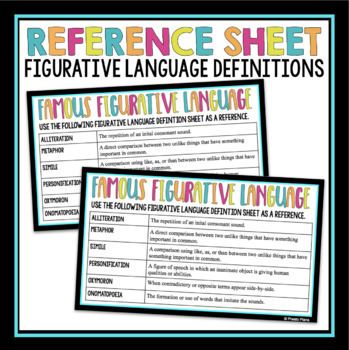 In this activity, students will circulate the room to find task cards with famous quotes that contain figurative language. They will record what figure of speech they think the quote uses on their sheet! The figurative language covered in these task cards are metaphor, simile, personification, alliteration, onomatopoeia, and oxymoron. 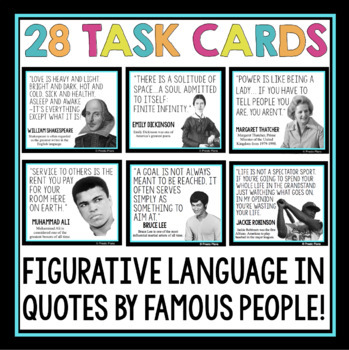 • 28 Task cards that include a quote from a famous person that includes figurative language. Each card also includes a sentence which tells you some information about the famous person. • A student reference sheet that includes the definitions of each of the figures of speech.